Madison, Wisconsin is a gorgeous state capitol with tons to offer visitors including free family fun. Located in Dane County, Madison is home to the University of Wisconsin-Madison (Go Badgers!). 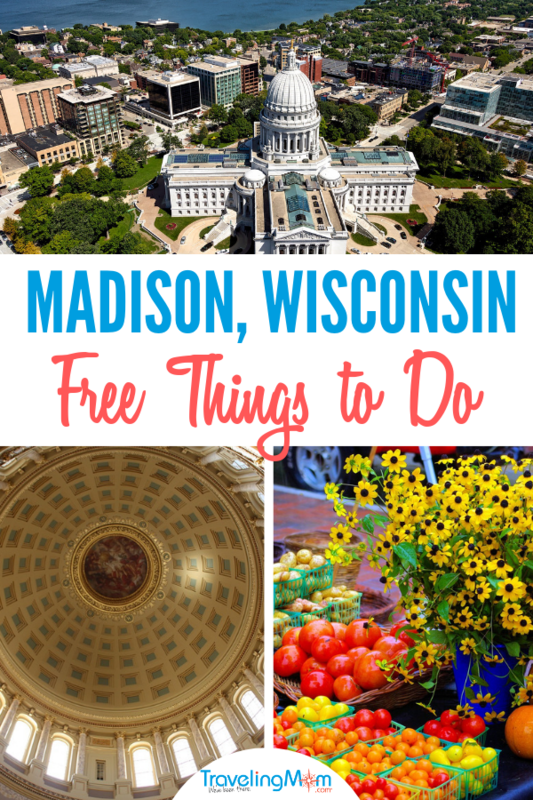 With restaurants, parks, free options and a airport nearby, you can plan the perfect family trip with our things to do in Madison WI list! As a travel writer, I am often asked – What are your favorite places to visit? A past job used to bring me to Madison, WI routinely and I grew to love it. Madison is a great family travel destination. 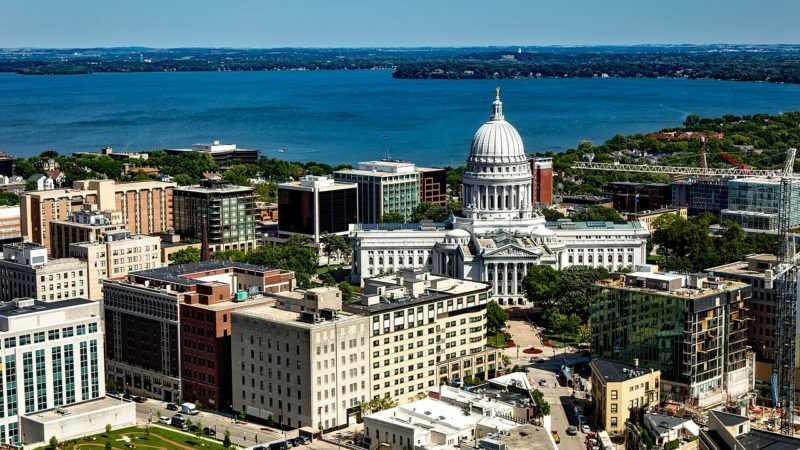 With plenty of things to do in Madison WI with kids, as well as great restaurants and affordable hotel options ,you should consider a visit to this state capitol. Think of it as a blend of Austin, Texas and Burlington, Vermont. You won’t be disappointed with our free in Wisconsin finds! Visit the Henry Vilas Zoo. I was slightly skeptical of the idea of a free zoo. Of the low cost zoos I’ve been to, I always feel like the animals look slightly miserable. Not so at the Henry Vilas Zoo. The zoo has some great exhibits and the animals seem happy and well cared for. Most exhibits have areas for the animals to go to when they need alone time. While this can make for some empty exhibits from time to time, the animals are choosing to come out and see everyone when they do so. Once you arrive inside the gates of the zoo, the pathways are very easy to follow. Grab a map and go; it is easy to wind your way along the paths without missing any sights. We started to the left as my son is a huge penguin fan. There were several areas to sit down to eat and you can bring picnic lunches. After that, consider ice cream treats. We found the concession stand prices so affordable that I highly encourage purchasing food to help support keeping the zoo free. All in all the zoo is a phenomenal value and is better and more family friendly than many paid zoos that I’ve visited. There are several free parking lots nearby and on street parking is also available. Stroller parking was easy and abundant. Also strollers and wagons were available for rent. 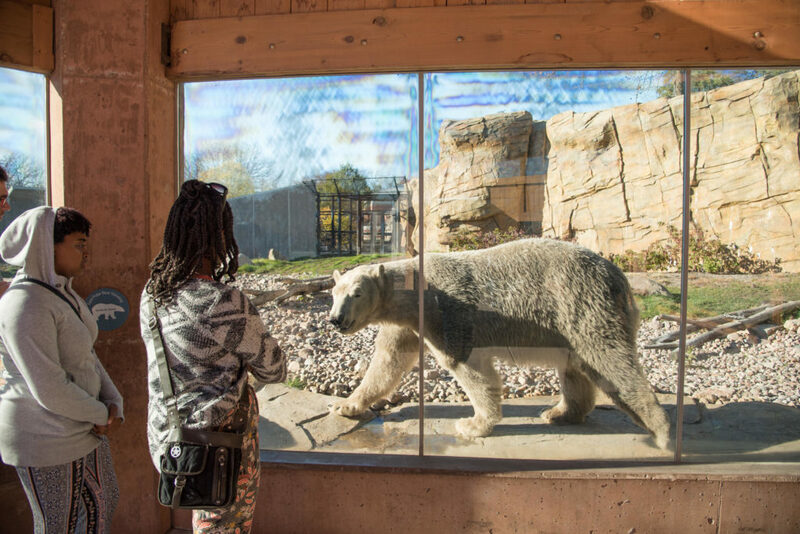 The Henry Vilas Zoo is open daily from 9:30a.m.-5 p.m. Donations are always welcome but not required. Embrace condiments at the National Mustard Museum. The National Mustard Museum is one of those sites that you go to to say you went. You enter into the gift shop and the museum itself is downstairs. It’s truly one of the most quirky free in Wisconsin finds we came across. It’s located in Middleton, about 14 minutes from Downtown Madison. You can try any mustard in the shop at the tasting counter. Pretzels are available for order at $2 each and can be topped with any mustard. On some days they’ll do brats or hot dogs. I highly recommend the Delicae Key Lime Macadamia Mustard (strange sounding- great tasting!). My son’s recommendation was the Inglehoffer Organic Honey Mustard and my husband’s vote went to the very spicy Galena 911 Spicy Hot Mustard. Buy some mustard to take home and pick up a “Poupon U” t-shirt for the lucky folks at home. The National Mustard Museum is open from 10 a.m.-5 p. m. 7 days a week. They do alter hours at times in slower seasons so definitely check out any changes here. Celebrate our Veterans at the Wisconsin Veterans Museum. A big hit with my son and husband was The Veterans Museum. Located on Capitol Square it consists of dioramas, life size figures, and painted murals in over 10,000 feet of exhibit space. There is one permanent exhibit about the Civil War and the 20th Century. Other exhibits rotate covering everything from military mascots to the employment of veterans. The Wisconsin Veterans Museum is open Tuesday through Saturday from 9 a.m.-4:30 p.m. and Sundays April through September from 12 p.m.-4 p.m. Learn more before you visit here. Rock on at the University of Wisconsin-Madison Geology Museum. The Geology Museum is located in the heart of downtown Madison in Weeks Hall on UW Campus. One of the things that I appreciated the most about the Geology Museum was the opportunity to pre-print the self guided tour book. This a great educational tool for slightly older children. The museum some noteworthy attractions. These include the Boaz Mastodon which was found by children in Wisconsin. Our family favorites tended towards the meteorites, fossils, and dinosaurs. Hours are Monday through Friday 8:30 a.m.-4:30 p.m. and Saturday 9 a.m.-1 p.m. Learn more before you visit here. A Free in Wisconsin Gem Flowers in Olbrich Botanical Gardens. Just a quick drive from downtown Olbrich Botanical Gardens offers free parking and sixteen acres of outdoor gardens. Conservatory admission is $1; free to under age 5, on Wednesdays, and Saturday mornings. The gardens are very stroller friendly and are handicap accessible. In addition, a tram that circles the property and drops up and picks off along the way. 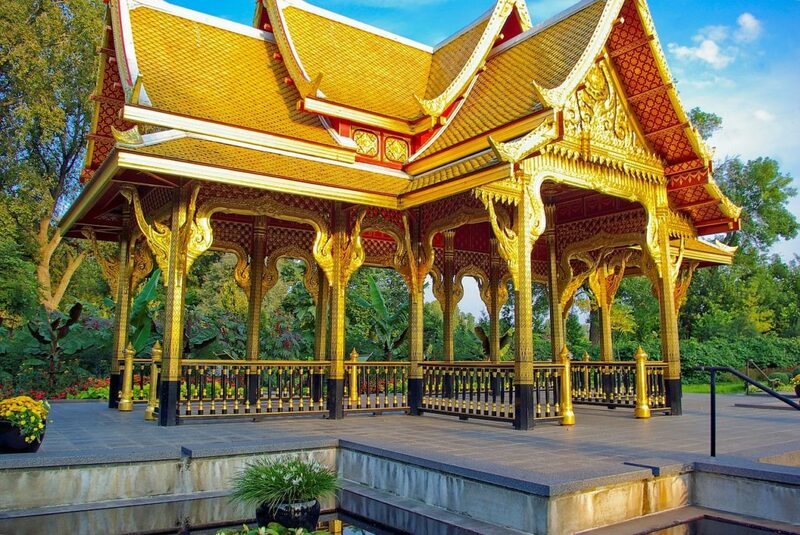 The outdoor gardens are divided into 14 separate and distinct gardens including the Serenity Garden, the Herb Garden, the Thai Pavilion and the Rose Garden. Pick a beautiful day, slather the kids in sunscreen, pack some books and a snack and take the kids on a fun and beautiful stroll! You may be saying “it snows in Madison for like half the year”. Never fear the Bolz Conservatory building is a glass pyramid that is open year-round. Olbrich Conservatory hours vary with the seasons. Opening occurs at 9 a.m. with closures as early as 4 p.m. in the winter. Be sure to check current hours here. Go Swimming at One of Madison’s Ten Lifeguard-Serviced Beaches. Beach and Wisconsin may seem like words that don’t go together. Don’t worry there are a few warm months in Madison! 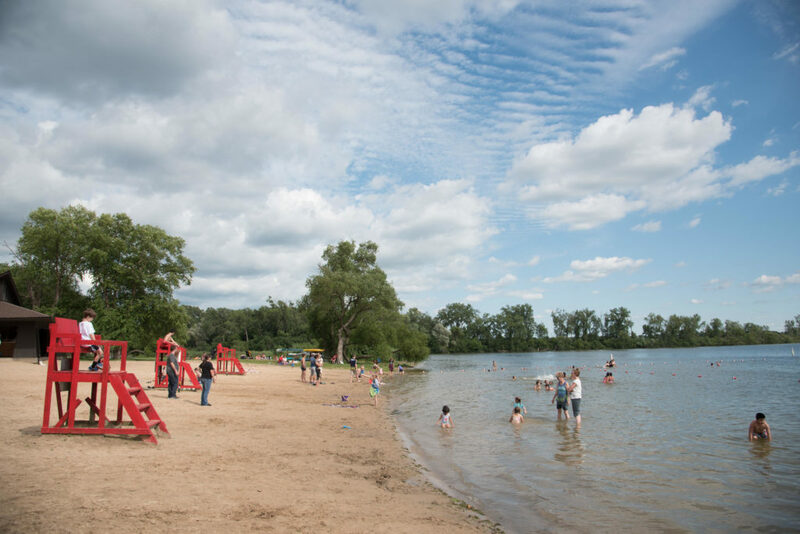 The Vilas Park Beach is adjacent to the Henry Vilas Zoo on Lake Wingra. With three playgrounds, a swimming area, two fishing areas, and a large grassy open area, this park has something for everyone. Tenney Park has a beach as well as other amenities but it’s biggest draw is the Tenney Locks. Kids will love watching boats go through the locks on Lake Mendota. Olbrich Park, next to Olbrich Botanical Gardens on Lake Monona, is one of Madison’s largest and in the winter boasts a skating rink. Be sure to plan for time in the play areas. Plan a Picnic and Bike or Walk the Lakeshore Path. The Lakeshore Path runs along the lake and Memorial Union provides an easy start. You can buy a picnic lunch ready to go there and walk or cycle your way to Picnic Point. There is even a bus- Campus Bus 80- that will take you there. There is even more to explore along Lakeshore Path like Indian Mounds, a hand pump driven bubbler, and rain gardens. You could spend a whole day taking in the free beauty of Madison. Visit the Madison Children’s Museum. There is an admission charge for the Madison Children’s Museum. There are a few ways to get free admission to the Madison Children’s Museum though. First, visit on the first Wednesday of the month from 5 p.m.-8 p.m. when the museum is free as part of their Access for Everyone program. Second, if you are employed in Wisconsin and work in one of the following professions – military, firefighter, EMT, teacher (preK-12) or police – a valid work ID will get you (not your whole party) free admission. Third, if you are a member of an Association of Science and Technology museum you can bring up to 6 people in for free. You must have your current membership card with you (it needs to display the ASTC icon) and a photo ID matching the name on your membership. The Madison Children’s Museum is open Tuesday through Sunday from 9:30 a.m.-5 p.m.
Take in History at the Wisconsin Historical Museum. This donation-run museum (adults are a suggested donation of $5) crams years of Wisconsin history into 4 compact floors on Capitol Square in Madison Wisconsin. Hours are 9 a.m.-4 p.m. Tuesday through Saturday. Learn more about visiting the Wisconsin Historical Museum here. Visit the Madison, WI State Capitol Building. 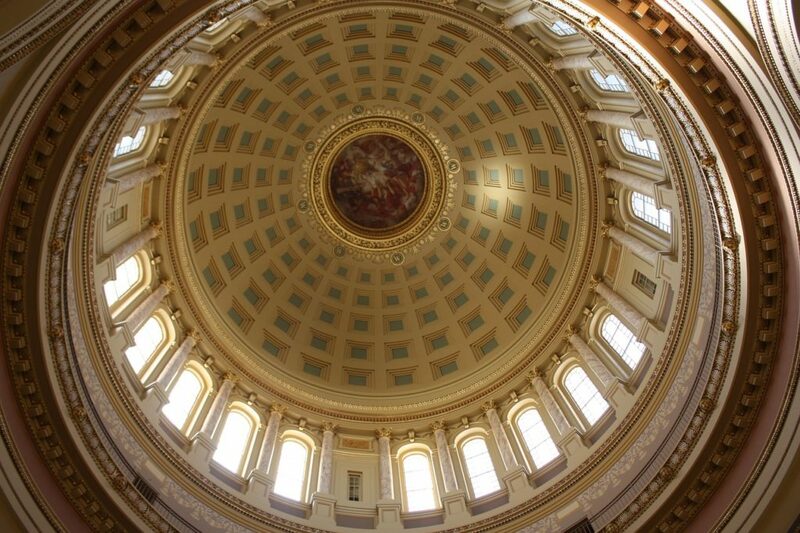 Take a free tour of the Wisconsin State Capitol. Tours are offered daily at designated times so be sure to check their website in advance. In the summer an upper observation deck is open giving great views of the downtown area and UW-Madison. Find out more information about tours here. Add a Stroll on State Street to Your Things to Do in Madison WI List. Sometimes walking around in a city is one of the best free things to do and Madison’s State Street doesn’t disappoint. 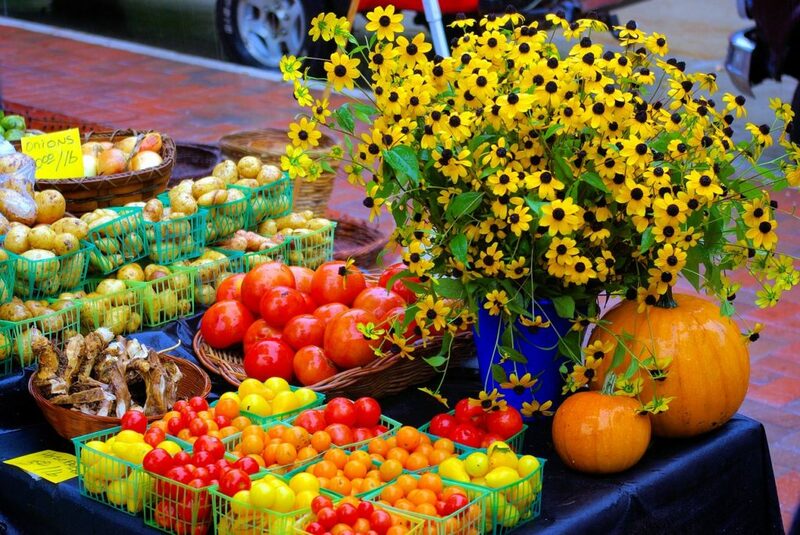 A favorite for me has to be Saturday mornings when the Dane County Farmer’s Market is open. This market is huge and filled with produce, artisan products and ready to eat food. Check out the University of Wisconsin-Madison Memorial Union Terrace. The Monona terrace presents free movies and music in the warmer months. While the Memorial Union is a membership organization (you have to be a member to buy alcoholic beverages) you can request up to three guest passes a year. This can be done in advance online or at one of the Union restaurants. The terrace is a great place to hang out whether there is an event or not! Walk in the Footsteps of Mammoths on the Ice Age National Scenic Trail. When completed, this trail will cover over 1200 miles. While you might not have that kind of time on your trip to Madison, you should check it out. There is a day hike on the trail located at Table Bluff in Cross Plains, WI. This is about a 30 minute drive outside of Madison. Looking for winter fun in Wisconsin? Check out these ideas. Heading to the Green Bay area? Don’t forget to take a trip down to Elkhart Wisconsin. Find the small town experience in Door County, Wisconsin. It’s a fun place for adults of all ages too. The Mustard Museum closes in May. +1 for the zoo picture Sonic sundae! The mustard museum is not closed; it just moved to a different location in Middleton. The Sonic in Middleton is “temporarily closed”, but it seems a bit sketchy because they’ve been closed for awhile and have nothing posted anywhere with an anticipated re-open date. Ella’s deli is now permanently closed. I can confirm Jamie’s info!